South Ayrshire Council, the local authority for Ayr, does a wonderful job providing so many good quality municipal golf courses for its residents at very affordable green fees. The local government body has eight such courses throughout the county and they promote the Lochgreen links in Troon and the parkland layout of Belleisle in Ayr as their premier golfing venues. 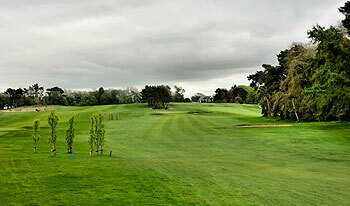 There are actually two 18-hole layouts within the Belleisle estate – the other being the modest, 5,481 yard Seafield course – but it is the championship course of Belleisle, designed by James Braid in 1927, that attracts many visiting amateur golfers. In fact, it impresses the golf professionals too, as it was used before in qualifying for the European Open held at Turnberry in 1978. Where Scottish golfers may argue over whether Carnoustie or St Andrews have the best public links courses in the country, there is little argument over which is the best public inland course – step forward the one and only true contender; Belleisle! Set in rolling woodland, the course is routed over classic estate territory with wide, lush fairways, stands of mature trees, penal rough and well-bunkered greens. Don’t be fooled by an overall length of just under 6,450 yards on the scorecard as only two of the nine par fours – the 8th and 9th – are under four hundred yards long. After the fifth and final par three has been played across water at the tricky 17th hole, the round ends at it starts, with a great par five hole, the 532-yard “Brown Carrick” where a right dogleg must be negotiated on the way to the home green. Belle isle is gorgeous. This a true parkland course. So it's municipal but what a great layout and what a setting; It's not for the golf snobs who want all the clubhouse razzmatazz. For a good value round of golf this is hard to beat. A good course for a municipal parkland, which I found in good condition for the time of year, during the springtime of 2011. However, its flaws were also evident. The greens were of mediocre condition but I am happy to concede the time of year was a major factor. The course is parkland in the strictest sense: it resembles a Victorian-era park with some golf holes spread around. It has a few standout holes such as the 2nd, 3rd, 5th and 18th, which all have great design. However, the rest of the holes lack definition, as if the local council is almost ashamed to be using municipal land for golf. In this respect Belleisle reminds me of a particular municipal in London, although Ayr council looks after Belleisle much better. However, you feel that with a light touch of sympathetic renovation the original Braid design could be brought up closer to the level of this master’s more timeless layouts. Good but not great in my view although the green fee is reasonable for what is on offer but I have played courses in Scotland with a lower ranking that I rate more highly. OK, Belleisle is a public municipal course and if you are a golfing snob, you might not want to be seen here. If you want to play a top class parkland course that is immaculately maintained and excellent value for money, you are at the right place. There are not too many public courses that have hosted professional tournaments, but Belleisle, along with St Andrews falls into that category. This tough parkland course opens up with back-to-back par fives and measuring some 6,500 yards this is no pushover. I’ve played plenty of Top 100 courses but for me Belleisle matches up to them and it won’t make a huge dent in your wallet. This being my home course this review may be biased, but i genuinely think is is difficult to come across a better parkland layout in Scotland, maybe Britain. The par 5 first is a good birdie opportunity but trees encroach on the tee shot on the left and right, it is then played uphill to a well bunkered green. The second is also a par 5 with cross bunkers stopping you hitting it down the hill for an easy approach. OB at the rear of the green, bunker short right and banking sloping away on the left, make this large but not overly contoured green well guarded. The third is a long uphill par three played through a tunnel of trees to again a well bunkered green. The course continues in the same way with large subtle greens and lot of bunkers. The back nine starts of with a benign par three, but then the 11th, 12th, and 13th are long par fours with the 12th being my favourite hole. A good tee shot will place you just short of two banks of trees, leaving you a mid to long iron to a steeply uphill green, guarded by a massive oak at the back of the green. The 16th is another favourite with a hybrid needed to lay up short of the 'Slaphouse' burn with then another hybrid needed to reach the green. This is a real gem of a course and having played many great tracks around Europe, nothing can beat a saturday afternoon game round Belleisle. This is a real James Braid classic and deserves to be in the top 5o at least in scotland. With a well stocked pro shop and new green keepers that are working hard to keep Belleisle at a great standard this should be a must play for everyone visiting Ayrshire. Played here in August 2003 and was impressed by the condition of what is essentially a "council course". Set in a large wooded estate, Belleisle has a lovely parkland feel, with generous faiways and large greens. For the amount of traffic that must pass through, it was in remarkable nick so late in the season. If you baulk at the fee to be paid at the more upmarket coastal courses in Ayrshire then the modest green fee here represents great value. One of the best courses i have played in the central belt and i would definately reccomend it. A real bargain! One of the best inland courses in Scotland. A real James Braid design. A must for the serious golfer!